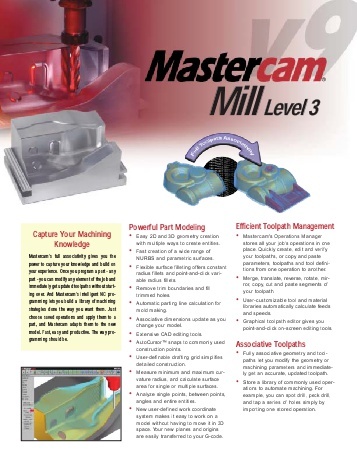 Mastercam’s full associativity gives you the power to capture your knowledge and build on your experience. Once you program a part – any part – you can modify any element of the job and immediately get updated toolpaths without starting over. And Mastercam’s intelligent NC programming lets you build a library of machining strategies done the way you want them. Just choose saved operations and apply them to apart, and Mastercam adapts them to the new model. Fast, easy and productive. The way programming should be.